Created by the Ottawa choir Seventeen Voyces, and conducted by their music director Kevin Reeves, An Evening with Berlioz is a multi-media presentation that mixes film, music by Berlioz, Beethoven, who influenced Berlioz, and Mendelssohn, his Romantic contemporary, and a performance by an actor portraying the composer. The script is based on Berlioz’s Mémoires, salient features of which were selected by Kevin Reeves. The show was first performed in 2003 (for Berlioz’s bicentenary) and 2004 in Ottawa; it was repeated on 13 and 14 March 2015 at the Southminster United Church in Ottawa. In this performance actor Peter James Haworth portrayed the composer. Also, there were about 12 actors pre-filmed on the screen behind Berlioz, who were either friend or family or foe. The photos were taken by 21st Century Bohemian Photography. 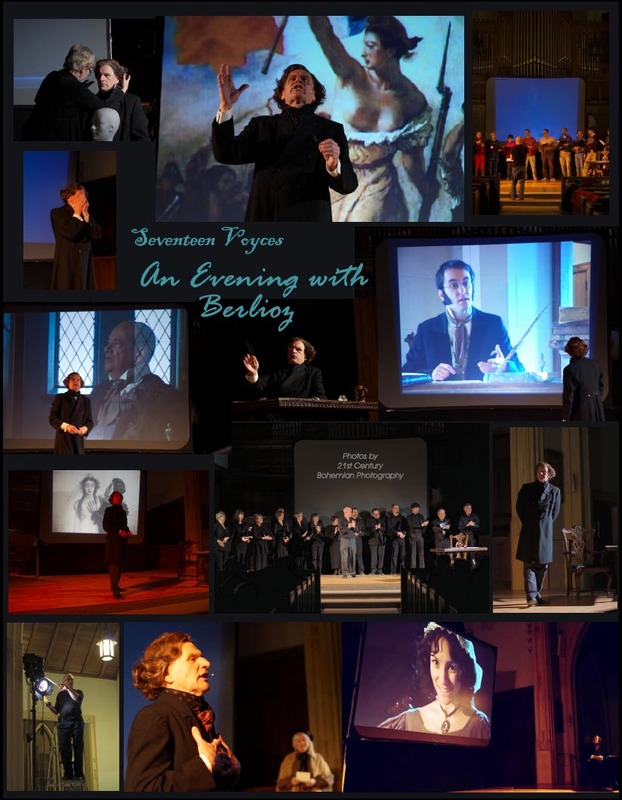 We are most grateful to Mr. Kevin Reeves for sending us the photo montage and information regarding the performances of An Evening with Berlioz, and for granting us permission to reproduce them on this page. The Hector Berlioz Website was created by Monir Tayeb and Michel Austin on 18 July 1997; this page created on 1st January 2016. © Unless otherwise stated, Monir Tayeb and Michel Austin. All rights of reproduction reserved.